Suraj Kumbar Post Graduate Scholar, Department of Panchakarma, Sri Dharmasthala Manjunatheshwara College of Ayurveda and Hospital, Hassan, Karnataka, INDIA. Lohith BA Professor, Department of Panchakarma, Sri Dharmasthala Manjunatheshwara College of Ayurveda and Hospital, Hassan, Karnataka, INDIA. Ashvinikumar M Professor & HOD, Department of Panchakarma, Sri Dharmasthala Manjunatheshwara College of Ayurveda and Hospital, Hassan, Karnataka, INDIA. Shameem Banu Post Graduate Scholar, Department of Panchakarma, Sri Dharmasthala Manjunatheshwara College of Ayurveda and Hospital, Hassan, Karnataka, INDIA. We are in technical era where there is more of sedentary life style and stress along with this urbanization is affecting our quality of food and health. This is leading to many lifestyle disorders and hormonal imbalances in our body. Hypothyroidism one among the endocrinal disorder. Thyroid is an endocrinal gland secrets T3 and T4 hormones regulated by TSH which is secreted by Pituitary gland. These hormones have two major effects on the body, 1) To increase the overall metabolic rate in the body 2) To stimulate growth in children. Hypothyroidism is common health issue in India. The highest prevalence of hypothyroidism (13.1%) is noted in people aged 46-54yrs old. With people aged 18-35 yrs being less affected (7.5%). To prevent these hazards Panchakarma is beneficiary to maintain metabolic rate. Here an attempt is made to diagnose hypothyroidism in the light of Ayurveda and management guidelines through Panchakarma. KUMBAR, Suraj et al. ROLE OF PANCHAKARMA IN THE MANAGEMENT OF HYPOTHYROIDISM. 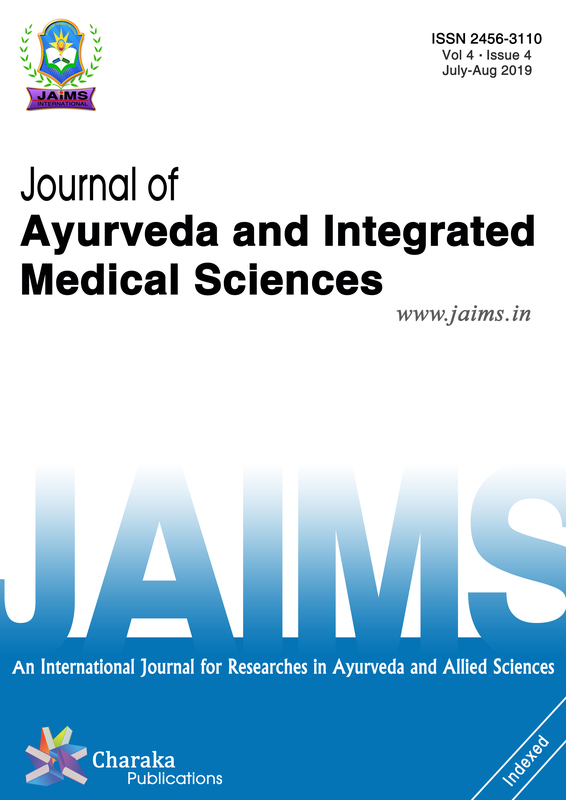 Journal of Ayurveda and Integrated Medical Sciences (ISSN 2456-3110), http://www.jaims.in/index.php/jaims/pages/view/Citation, v. 4, n. 1, p. 57 - 60, mar. 2019. ISSN 2456-3110. Available at: <https://jaims.in/index.php/jaims/article/view/757>. Date accessed: 25 apr. 2019. doi: https://doi.org/10.21760/jaims.4.1.11.